We bring forth for our customers an exclusive range of Tool Hose Balancer that helps in preventing the fall of the device, in case of a spring failure. The tool suspends the device in the air and thus, provides it with complete safety from any sort of damage. As a leading Supplier, Exporter and Importer, we present this unique tool and is an extremely popular product in the market. . For our esteemed customers, we make it available at marginal rates. When the spring failure is happened, the fall prevention device will operate and stop the suspended tool / device. 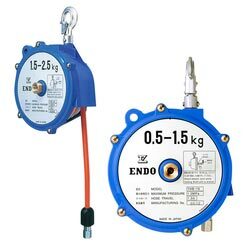 (Endo-Kogyo is the first balancer manufacture to equip this safety device in Japan). The inside diameter of hose is 8.5mm which supplies enough air to operate the suspended air tool / device. Comparing with the ATB series, using the THB series can apply with more various kinds of the air tools.